PH Acidity level in the body is a major common denominator in almost all diseases. Every disease begins at a cellular level. All cells live in and are bathed in fluid. The human blood is a transport system to bring nutrients to the cells and shuttle the debris and results of metabolism out to the removal sites. The blood transports acids to the connective tissues and the extracellular spaces in the body for storage. The collagen fibers in the connective tissues of our body catch and store the trapped acids until they are cycled to the kidneys for excretion. If too many acids become stored in the body it becomes an acid burden that causes inflammation, pain and host of other illnesses. Therefore, naturally treating the environment the cells live in is the best place to start healing the cells no matter what the disease. 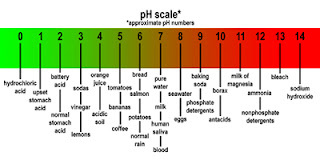 The range of pH is set on a scale of from 1 to 14, with the pH of 1 is the most acidic, (like battery acid), and the pH of 14 is the most basic, (like oven cleaner). Water is supposed to be neutral with a pH of 7.0. Human blood should always be a pH of about 7.40. The morning cycle (around 4 A.M.) is the Acid Tide when we become the most acidic as acids reach maximum concentration in our body fluids and urine. Conversely, the afternoon cycle is called the Base Flood (around 4 P.M.) when we are the most alkaline after lunch has been metabolized. This is when the most bicarbonate is being generated by the stomach. Because the body remineralizes via the acid tide/base flood, encouraging the pH cycle will bring about a range of health benefits. Acetic acid in vinegar, tartaric acid and the acids in most fruits and lemons contain minerals which are basic. Weak acids combine with water to be converted into carbonic acid which further breaks down into carbon dioxide and water. Carbon dioxide exits through the lungs and water exits via the kidneys. The minerals in these weak acids replenish your mineral supplies. Weak acids actually help to alkalinize the body by adding more minerals to it. Sulfuric acid, phosphoric acid and nitric acid are formed by the metabolizing of proteins. These acids are excreted by the kidneys and as these acids pass through the kidneys, they utilize basic minerals to neutralize them so they don’t burn the kidneys. Sulfuric acid uses the calcium taken from bones to neutralize and form calcium sulfate so it does not harm the kidneys. The more basic minerals are taken from the body and used to neutralize these strong acids, the more the body becomes acidic. The body takes sodium chloride (salt) in the stomach and breaks it down into Hydrochloric acid (HCL) and sodium bicarbonate which is made by the parietal cells in the stomach. HCL does its part to sterilize food, ionize minerals and convert pepsinogen into pepsin to break down proteins in the stomach. The sodium bicarbonate enters the blood stream to circulate through the body where it flushes the acids out of the connective tissues. Any extra sodium bicarbonate is collected by the kidneys, liver and pancreas. When there is not enough sodium bicarbonate in the body, the stomach has to produce more HCL to make more sodium bicarbonate. Since HCL and sodium bicarbonate are made from sodium chloride, low salt diets and processed-demineralised table salts can drive the body into acidosis. Consuming a high mineral salt, like Himalayan or Celtic Sea Salt, is very important. Without sodium chloride you cannot make HCL to break down minerals and digest proteins. Without minerals, the acids become trapped in the extracellular spaces causing inflammation and disease. When the HCL content of the stomach is deficient, grave results will inevitably appear in the metabolism as there is a gradual starvation of the mineral elements in the body. Food will be incompletely digested and nutrient assimilation will fail. Next comes a septic process in the tissues such as; pyorrhea, dyspepsia, nephritis, appendicitis, boils, abscesses, pneumonia, etc. Deficiency of normal acids leads to a stagnation of the gall bladder and pancreas, leading to diabetes and gallstones. To determine your pH, use litmus paper to gage the body pH of your tissues with the second urine specimen in the morning. A perfect reading would be pH 6.8. Recheck the urine at 2:00 P.M. to see that there is base flood of about 7.6. The main reason we become acidic is from over-consumption of protein. Humans need about 40 grams of protein daily, but the average American diet contains about 200 grams of protein a day. Base minerals that are lost with the consumption of excess protein acids need to be replaced. Taking an HCL supplement like Betaine HCL with the morning and noon meals will help provide the stomach with the acids necessary to break down nutrients for assimilation and also help lower the ph to create an acid tide. Taking ¼ to 1 teaspoon of aluminum free baking soda in the late afternoon will stimulate the production of more hydrochloric acid, and the blood borne bicarbonate to create the base flood. Over-the-counter antacids are histamine H2-blockers that treat symptoms of acid reflux but cause a gross imbalance in the ph balance of the body. These drugs include Tagamet, Pepcid, Zantac, Axid and others. These drugs block the production of HCL in the stomach, interfere with digestion, short the body of critical minerals and short the sodium bicarbonate supply in the body.